Ghostface costumes, 90s teenagers sitting around the fire telling stories based off of actual horror movies. Despite the less-than-positive reputation that horror movies and horror fans supposedly have, other genres and mediums certainly seem to enjoy venturing into the horror world. For someone like me, there is nothing more exciting than when your favorite TV shows honor the slashers you love most. I thought it was time to share some of my favorite slasher episodes of great TV shows with all of you, so here they are in no particular order! 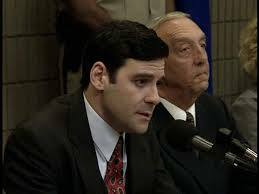 The Reno Sheriff’s department is released from prison, causing the downfall of the man who put them there. He sees himself as the victim, and in amusing slasher movie parody, he sends menacing notes (I Know What You Did Last Summer style) and leaves threatening voicemails for each of the deputies. This is only made funnier by the fact that none of the deputies are even remotely frightened by him. In true slasher fashion, Mike Powers lures the group to him under the guise of a reunion, in an attempt to exact his revenge. But unlike true slashers, he doesn’t plan to stalk them and off them one by one. He plans to shoot them all right in front of each other—after making them dig their own graves in the woods. Mike Powers is a true parody of the hillbilly slasher villain. Dawson’s Creek: Four Scary Stories ~ I’ll admit that I fell into the craze surrounding this show. What can I say, Joshua Jackson was THE it boy of the 90s for me. It was a surprisingly good show given what it was, and to this day, this particular episode remains my favorite of all of them. It makes sense that Joshua Jackson was at the center of this episode, as it was clearly a sort of nod to Urban Legends, which he starred in. As usual, Pacey is his snarky self and initiates a conversation about horror movies, and what the teens consider scary. From this point, it falls into Scream territory as Pacey, Jack, and Joey deconstruct the horror genre and eventually start to tell their own scary stories, two of which are slasher based. A girl trapped in a school library with a creepy guy following her around. Being stalked on a dark and deserted road late at night. False scares. Stopping at the old redneck diner to use a phone because your cell phone isn’t getting a signal. The slasher movie tropes abound here. I recently re-watched this episode and immediately remembered why I fell in love with it. It accurately represents where the horror genre stood at this time and pays tribute to not only Urban Legends, but the entire slasher genre. 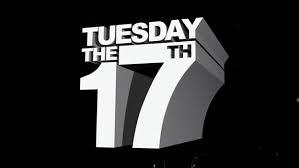 Psych: Tuesday the 17th ~ What happens when a show rooted in perfect 80s references discovers that its star, who can also write and direct, is a lover of horror movies? You get a perfect parody/tribute episode of one of the most popular slashers, Friday the 13th. When Shawn Spencer is recruited to help his old nemesis (a guy he’s jealous of and thinks is trying to steal his best friend) open a camp, things get eerily familiar as this good cause turns into tragedy. A killer appears to be on the loose, and Shawn has to figure out how to survive, using his knowledge of 80s slasher films. You can always tell when someone writing a horror episode of a TV show respects the genre, or if they’re making fun of it because they hate it. In this case, it is clear that James Roday (star of the show, writer and director of this episode) is 100% in love with them. Roday doesn’t belittle Jason Voorhees or slasher movies: he uses comedy to construct a love letter to them. In fact, he understood the legacy and place of Friday the 13th (as well as the other slasher films this episode parodies) in horror history in that he has his character and the other main character (his best friend Gus) switch roles. Usually Gus is the one running scared and Shawn is almost fearless, but here Gus tries to be brave while Shawn cowers in fear and tries to play it safe. Even Shawn knows not to mess with Jason. 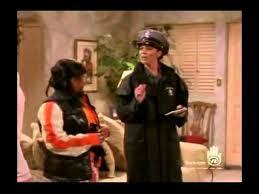 Moesha: I Know What You Did In The Third Grade ~ Yet another example of a show capitalizing on the horror movie its star featured in. As the title gives away, it’s a spoof of I Know What You Did Last Summer, which is no coincidence since it aired right before the release of the sequel, which Brandy Norwood was in. Moesha and her friends receive (as usual) menacing notes reminding them of a tragedy they instigated back in elementary school. The three spend the episode running scared, until they finally come face to face with the boy blamed for what they did. Eventually, truths are revealed and the episode wraps up in typical sitcom resolution fashion, only it's actually hilarious. As spoofs go, this was one was cute and had its funny moments. It even had the supposed back-for-revenge killer dressed in the same attire as the actual movie’s Ben Willis. And it stayed true to the movie with a classic misdirect. This episode pokes fun at the over-used trope of revenge slasher movies and the ideology that someone who in real life would have long gotten over whatever was done to wrong them, would suddenly decide to seek revenge a decade or more after the original incident took place. 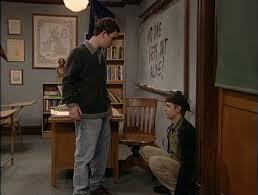 Boy Meets World: And Then There Was Shawn ~ This episode is clever on its own merit because it was a perfect comic relief after the melodrama of the rest of the season that came before it. But on top of that, it also was a love letter written to slasher movies, from the perspective of its core audience. 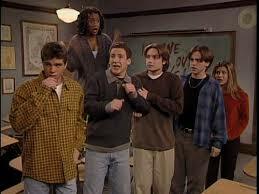 After Cory and Topanga break up, poor Shawn feels trapped in the middle and acts out in Feeny’s class, causing the others to do so, and ultimately landing them all in detention. In detention, they are left alone with a random other student who gets killed and the group realizes there is a slasher murderer among them. The best thing about this episode is that the writers totally nailed picking the right character to be their version of Randy Meeks. I always bought Shawn as the type who’d be a horror movie fanatic. So it makes perfect sense that he’s the one who tells the others what to expect and gives them the rules. And Then There Was Shawn is half parody, half actual slasher episode. It’s about as scary as a show of this nature could actually be allowed to get. And it even has that lovable slasher teen humor complete with sexual innuendo (well, for a family comedy). I love a good parody episode that is filled with 90s references... including bringing up genre-star Jennifer Love Hewitt. I love this episode so much because I saw it right around the time I was just beginning to develop a true love of horror, and it was a cute, if cheesy, homage to everything I came to love about it, while also sending the message that even in the darkest times for a teenager (breaking up with your one true love, having your best friends cause you to lose hope in everything you believe in), you can still take refuge in the things that make you laugh, even the things that made you scared.